Much of this website has been devoted to decoding “liberal” propaganda, especially the repetitive strains of populism that will constitute the Democratic Party playbook in 2012 as we move toward an election that will either push us yet further on the path to communism or dirigisme (a form of elite rule where the state not only regulates the economy but directs investment), or that will reverse course and could restore the American economy along more laissez-faire lines. The rhetoric of “families” can be seen as entirely about collectivist identities, or it can be seen, also, as a plea to corporations to look upon their employees as children whose demands should be met through further concessions. The index that follows is only a small portion of what has been my major concern: the authoritarian character of American political culture since the New Deal. Sadly, Popular Front politics have masked the penetration of communist and other statist ideas into the mainstream political discourse. 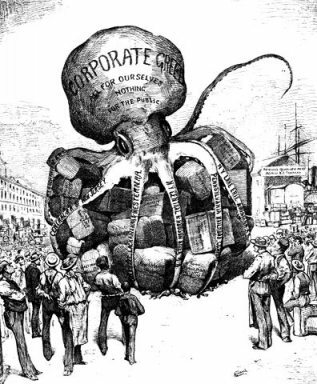 In sum, the State exists to cage the octopus of “finance capital.” That is the unifying theme of today’s “progressives” and before that, the Progressive movement: such populist scapegoating provides a bogus image of unity in fragmented societies. And recall that Hitler thought that the Soviets were not really socialists like himself, but were the puppets of “finance capital” a.k.a. the Jews.